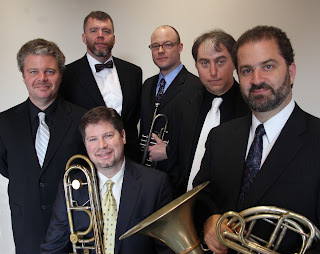 The Robert and Carol Morris Center for 21st Century Music is pleased to welcome the Meridian Arts Ensemble to the University at Buffalo for a week of original and virtuosic music for brass quintet. The Meridian Arts Ensemble, a long-time friend of the Center, has commissioned and premiered over fifty new works, and has emerged as one of the most important new music ensembles in the world. Having released nine critically acclaimed CD recordings on the Channel Classics label, the group somehow manages to also commission new composers, tour and perform on nine continents, and regularly win performance competitions. Featuring UB’s own Professor Jon Nelson, the Meridian Arts Ensemble began as a traditional brass quintet in 1987 and quickly rose to prominence winning four competitions in their first two years. In 1990 they won First Prize in the Concert Artists Guild New York Competition, which launched the group’s international career. With the addition of a percussionist, the group has performed extensively throughout the world in Cuba, Japan, Taiwan, Brazil, Germany, Holland, Belgium, Mexico, Austria, Costa Rica and Colombia. The Meridian Arts Ensemble has toured extensively throughout the U.S. as well, and has been hosted by prestigious venues and concert halls such as the Weill Recital Hall at Carnegie Hall, Lincoln Center, Merkin Hall, Seiji Ozawa Hall at Tanglewood, Chicago’s Symphony Hall and Pick-Staiger Hall, Los Angeles’ Ambassador Auditorium, the Cleveland Museum of Art, and Atlanta’s Spivey Hall (more information on their catalogue and recent activities can be found here). On Tuesday, October 18th at 4:00 p.m. in Lippes Concert Hall, the Meridian Arts Ensemble will host a composer workshop of seven of the University at Buffalo’s graduate composers including Esin Gunduz, Dan Bassin, David Rappenecker, Ethan Hayden, Ryo Nakayama, Juan Colón-Hernández, and Kenichi Saeki. The UB music department is populated by an incredibly original and diverse array of young composers from all over the world, and Tuesday’s composer workshop will be a great chance to see them workshop their music live with one of today’s top ensembles. Ethan Hayden’s piece, Chiral Fanfare, is based on the chemical phenomenon of ‘chirality’ in which two molecules consisting of the same atomic structure – but arranged as mirror images of one another – can have surprisingly different physical properties. The form consists of two sections, each of which feature the same few motivic gestures in drastically different environments, affecting the function and character of the resulting musical fabric. Contrastingly, Esin Gunduz’s piece, On texts of wisdom, will feature voice alongside trumpet and trombone, and include text from 13th century Turkish poet and Sufi mystic Yunus Emre. Each of the composers in UB’s composition program has a wildly unique voice and different musical background, making their concerts and workshops a very engaging listening pleasure full of skillful nuances and surprises, and Tuesday’s composer workshop promises to be no exception. On Friday, October 21st, the Meridian Arts Ensemble will treat us to a very special 25th Anniversary Concert of works they have commissioned from composers Dave Ballou and David Sanford, as well as perform their own arrangement of 16th century Italian Renaissance composer Giovanni Gabrieli’s Venetian Canzoni. The concert will begin at 7:30 p.m. and take place in Lippes Concert Hall.